*This article was updated Thursday, May 17th, 2018 at 4:08PM. This morning, Dean Liz Braun announced that she is resigning from her position as Dean of Students. In an email titled “Announcement from Dean of Students” to students, faculty and staff, Braun wrote that effective June 30th, she would no longer serve in the role. Braun shared she is planning on launching her own consulting firm specializing in higher education. According to Swarthmore’s online profile, Liz Braun joined Swarthmore College in July 2010. Having earned her undergraduate degree in English from Mary Washington College, a Master’s in English Literature from Boston University, and her Ph.D from University of Massachusetts-Amherst, she has had a number of leadership positions in higher education over the past nineteen years. She acted as the director of residential life from 1999 to 2003 at Mount Holyoke College. She previously served as dean of students at Mount Holyoke starting in 2003 as well as assistant director of residential life at Bowdoin College. Liz Braun’s initiatives included expanding Counseling and Psychological Services and the Health and Wellness Center, increasing staffing and support services for cultural centers, advocating for building developments such as the Matchbox and PPR Apartments, and creating the Office of Student Engagement and the Diversity Peer Advisor program. In her email, Braun stressed her continued focus on students and their needs throughout her time at Swarthmore College. Over three hundred students joined the sit-in at Dean Braun and Dean Miller's Offices this past week. Photo Courtesy of Organizing for Survivors. Her resignation comes less than a week after the end of a nine-day sit-in in Liz Braun’s office by Organizing for Survivors (O4S), an advocacy group of sexual assault survivors and allies. This sit-in began on May 1 as an escalation to the demands they delivered to President Valerie Smith six weeks before. Over 65 survivors and allies gathered March 4 to draft these demands and over two hundred came together March 19th to watch O4S’ Core deliver them. Among several revisions to current Title IX policy and procedure, O4S called for “individual staff changes and changes in institutional policy”. While also pushing for the resignations of Associate Dean of Students Nathan Miller and Associate Director of Investigations Beth Pitts, O4S called for the resignation of Liz Braun “for her historic and ongoing unwillingness to meaningfully respond to student concerns about policy and practice, as well as her past inappropriate conduct as a participant in the adjudication of Title IX cases other failures to protect students”. In open letters to each administrator, O4S detailed specific instances in which students have found mishandling of Title IX and encouraged each administrator to “immediately resign from [their] position.” “We do not believe meaningful change can occur without accountability for administrators who fail to protect students. We believe the harm you have already caused compromises your ability to effectively serve in this position at Swarthmore College,” O4S stated in each of their letters. Braun did not address O4S’ demands or Swarthmore’s Title IX policy in her resignation email. Over three hundred students participated in the sit-in, expanded from Liz Braun’s office to Nathan Miller’s as well. During this time, O4S hosted multiple “coffee talks” to explain their demands, sat in on administrative and committee meetings, held rallies in Parrish East, and, on May 7th, two O4S Core members and Dean Shá Duncan Smith co-facilitated a community conversation to reaffirm the College’s core values and to build on the work of survivors of sexual assault and sexual harassment. Dean Braun, Dean Miller, and Beth Pitts were invited to many of these events, but declined to attend. 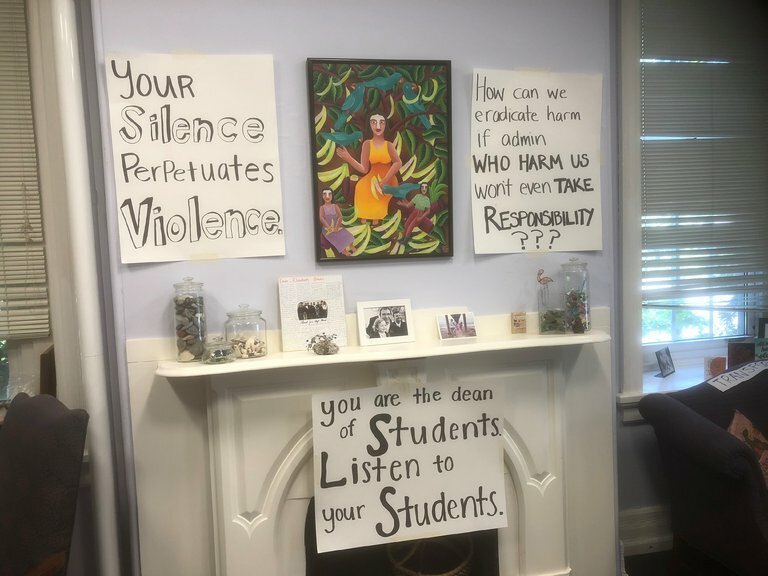 O4S concluded the sit-in on May 9th after President Smith agreed to meet with O4S’ Core, three faculty members, and five staff members to discuss each demand in full. The meeting resulted in specific actions the College will take to address some of the demands and a timeline for when these actions will be implemented, as well as a commitment to a second meeting to address the remaining demands, which occurred yesterday, May 15th. As students prepare for the summer, O4S members and allies continue to work with administrators to understand how Title IX can be improved and better implemented with a search for a new Title IX Coordinator, a new Violence Education and Prevention Advocate, and now, a new Dean of Students. "I am confident that the next Dean will be able to build on these improvements, and continue to work with the entire community to create an environment where all students are able to thrive, develop a strong sense of self as individuals as well as belonging to a wider, welcoming community, and maintain a sense of joyful intellectual engagement,” Braun concluded in her email. Braun has not currently been able to be reached for comment. O4S has not yet released a statement at this time. Voices is following this story as it develops. *Updated information: O4S released a statement on Wednesday, May 16th at 2:42 PM regarding Dean Braun's resignation via the group's Facebook Page.